Rhya x Stryder: In 2007, RHYA produced our first litter! She was bred to STRYDER, a beautiful and accomplished example of the breed. Stryder was otherwise known as Am/Can/BIS-UKC/BIS-Int'l Champion Sno Shire's Dealmein Sno Spirit, AX AXJ CGC. He was a Best in Show winner in both UKC and International shows, as well as a multiple Group Winner in AKC shows. Beyond that, he competed in Excellent Level Agility in AKC and had several years of experience of nursing home visits and presentations with and for schoolchildren. Just a really nice, sweet boy with a wonderful pedigree, temperament, and personality! You can see more of Stryder at Sno Spirit. This litter produced 7 lovely puppies, and we kept TASSI. Rhya x Emrys: In 2010, Rhya produced our second litter. 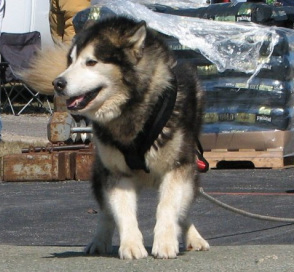 She was bred this time to EMRYS, who was not only a lovely dog and AKC Champion, but a proven working dog in harness. Emrys was aka: Ch. O'Artic Wind's N Istari's Emrys, WTD WWPD. He put in many miles on the sledding trail, and pulled many a loaded cart in the weight pull chute. He has offspring with Championships (including a Best of Breed at Crufts! ), working titles, and obedience titles, and we are delighted to have had the opportunity to bring Emrys and his pedigree into our breeding program. You can see more of Emrys and his relatives here. We raised 2 puppies from this breeding, including Coby. Tassi x Phoenix: In 2012, Tassi was bred to a carefully-selected dog, Phoenix: GCh. Ch. Kasaan's Rise'N Up To T' Fortune. Phoenix is a sweet boy with a wonderful temperament. He has not only done very well in the AKC and Canadian show rings (Best Puppy In Show in Canada), but has also been training in harness and has earned one leg toward his Working Weight Pull Dog title. He is a proven sire of similarly accomplished offspring. You can see more of Phoenix and his relatives at Kasaan Kennels here. Tassi produced 6 lovely puppies, including Kacey. Kacey x Bucky: In 2016, Kacey was bred to a young dog with a happy-go-lucky temperament and beautiful structure. Bucky: Kaviak's Tarnish Spend A Buck, is just beginning his show career and this was his first breeding. Bucky brings a whole new pedigree into the mix here and it is very exciting! You can learn more about Bucky and his family here. This breeding resulted in our wild child Teega- lots of adventures are in store for her future!